There has been devastation in Japan caused by an earthquake, a tsunami, and a damaged nuclear power plant. The earthquake struck on March 11 off the north-east coast of the country, about 250 miles (400 km) from its capital city Tokyo. It was a magnitude 9.0 on the Richter scale. The earthquake was the largest recorded in Japan and the fourth largest recorded in the world, since 1900 (when earthquakes started being measured). The earthquake pushed the sea floor up, causing a large amount of water to be displaced. The water displacement triggered a massive tsunami where monstrous waves (some even 40 feet or 12 meters high) hit the coastal towns near where the earthquake had struck. The giant waves destroyed homes, cars, boats, roads, and flattened some towns. Over 10,000 people have died, thousands are still missing, and many of the survivors in the area are without electricity and water. The tsunami traveled close to the speed of a commercial jet plane and even made it across the Pacific Ocean in less than a day to hit the western coasts of the North and South American continents. You can watch the video of the tsunami travelling here. 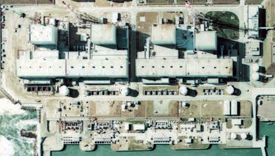 The tsunami damaged some equipment at the Fukushima nuclear power plant in Japan. A nuclear power plant uses nuclear energy to create electricity. Nuclear energy is the energy in the core of an atom – those teeny weeny particles that make up every object in the universe. A lot of energy is released from atoms by splitting them into smaller ones. This energy travels as “radiation” and is used to produce electricity. During this process, high levels of “radiation” are produced inside the nuclear plant. The damage in the nuclear power plant has caused some high level radiation leaks, which can be dangerous to humans. Thanks to the earthquake, a day got a wee bit shorter – by 1.8 microseconds (a microsecond is one-millionth of a second). The earthquake caused a shift in Earth’s mass which in turn sped up the Earth’s rotation!